No account necessary. No hidden costs. 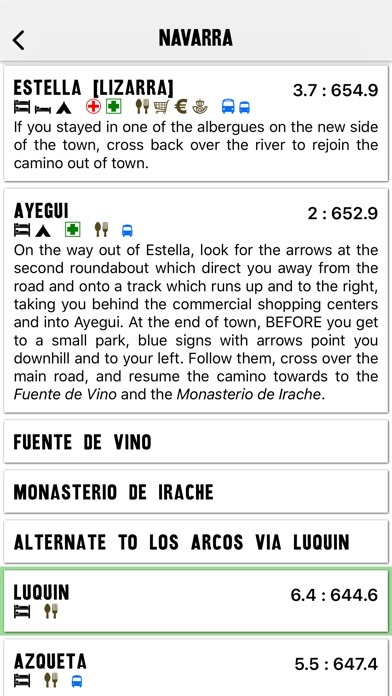 Now in their 7th year as a mobile app, and their 10th online, the Wise Pilgrim Guides are the go-to source of up-to-date information on the Camino de Santiago. 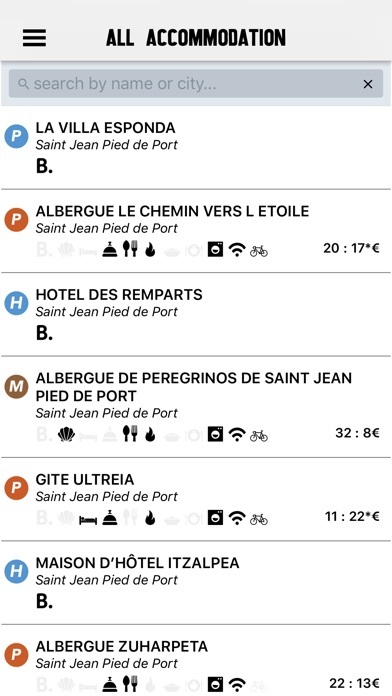 The app is updated regularly with new content and new features and offers you the ability to leave tips for pilgrims following behind you. 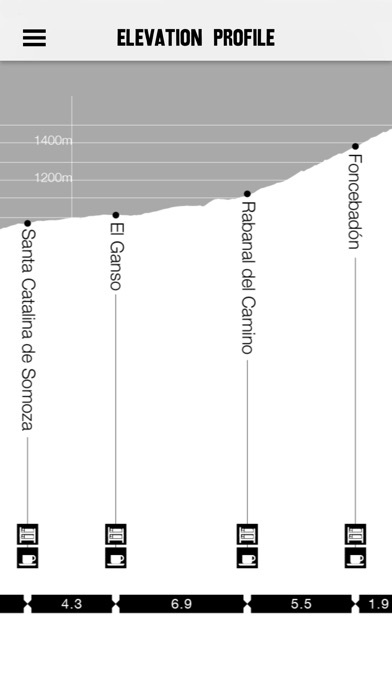 This guide covers the Camino Francés, the most popular route across Spain. It has been redesigned and now works almost exclusively offline (to share your comments with others will require a data connection). 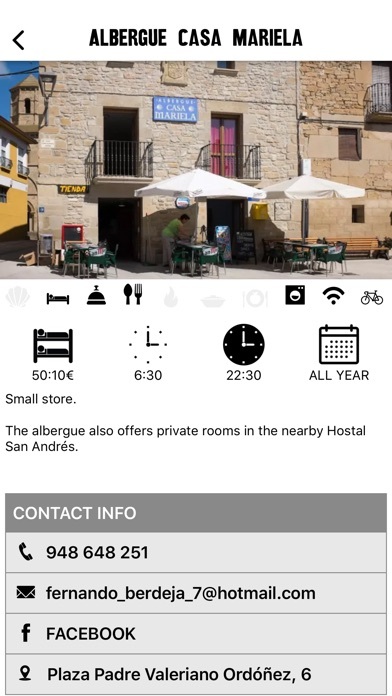 As more an more albergues share their WiFi this becomes less of an issue, and the guide will tell you which ones offer WiFi. 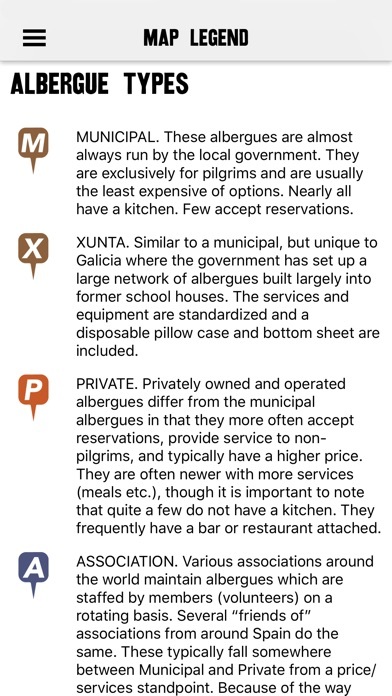 Accommodation Directory: A full directory of Albergues, camping, hotels, pensions, paradors, and cases rurales. Over 900 in total, with special attention to those that can be booked online. Stageless Guide: No more "stage anxiety" or guide created bottlenecks. Maps: Offline and online versions of a beautiful topographical may will give you a good view of the terrain ahead. 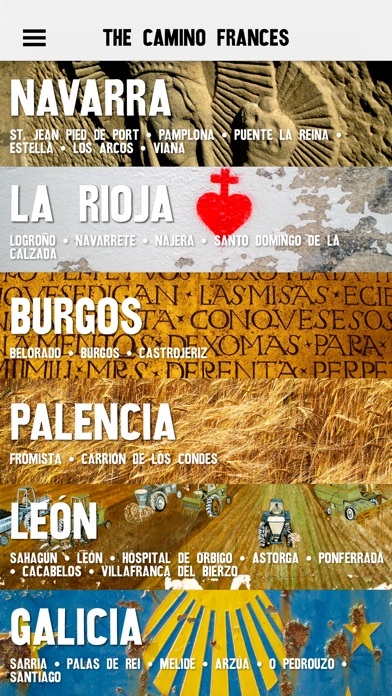 Photos: Photos of albergues, monuments and other points of interest along the way. Currently 900+ images and growing. Scrollable Elevation Map: This one is hard to show with just a screenshot, but the elevation that appears at the top of every city page scrolls East to West. One complete elevation, from St. Jean Pied de Port to Santiago, uninterrupted by page folds. Comments: Albergue closed early for the season? Have a restaurant that you want to share, or perhaps one to warn others about? Every location in the app gives you the opportunity to leave a comment and to read the comments left by others. No registration necessary. ¡Buen Camino and thank you for your support! 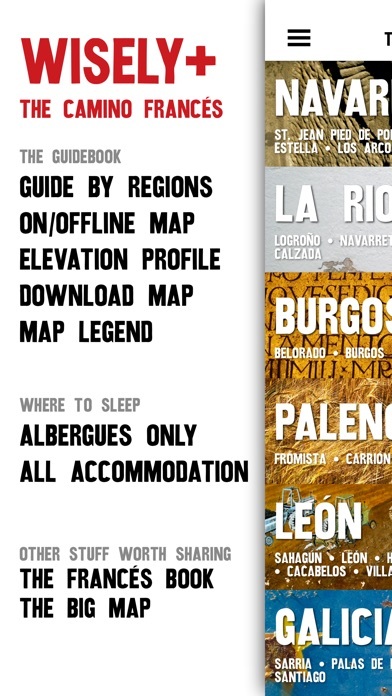 I bought this app because I don’t want to carry a guidebook on my Camino. However, every time I try to open the app, it immediately quits working. Just downloaded the app and it crashes on opening. 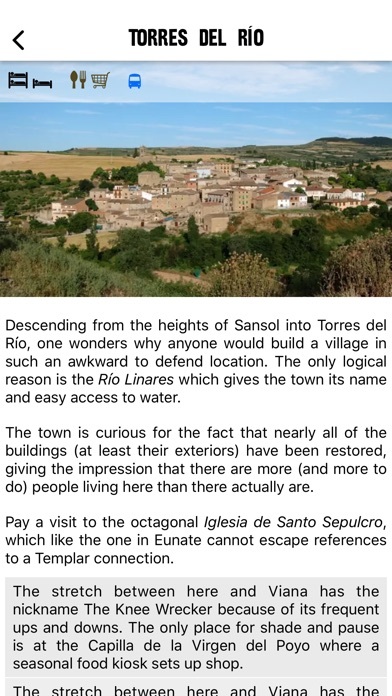 When talking to people planning their Camino I give them three bits of practical advise: 1. You don’t need boot—use trail running shoes. 2. Learn some Spanish. 3 Get the Wise Pilgrim app. This app’s functionality is highly disappointing. I’m on the Camino now, and more often than not (about 90% of the time), it does not open correctly. That is, the screen open the immediately closes. However, when I view all of the currently open apps, it shows the app as being open. About 25% of the time, I can open the app from there. But the other times I need to close the app fans start over/try again later. When it works, the information is useful. Crashes upon open frequently, but just click it 3 or 4 times and it works, so maybe 2 stars would be more appropriate. Not optimized for iPhone X screen size. Used it for partial Camino from SJPDP to Fromista in 2017. Like the elevation profile. Albuergue guide a bit basic but complete, a narrative review might be nice or more user comments would be nice. Comments are recent only. Decent narrative for route but a bit difficult to access, you tap The Provinces, the you find your area. Took a bit to discover that. No offline map, so I downloaded competitor app thar has gps and oggline map. No customizable schedule/route. Well it’s a good thing I follow groups related to camino so I can get more current updated information. Relying on an app that isn’t updated to plan and navigate isn’t all that wise, IMO. This app was incredibly valuable when I walked the Camino Frances in 2025, but it has quit working on my iPhone X. Each time I open it the app immediately quits. 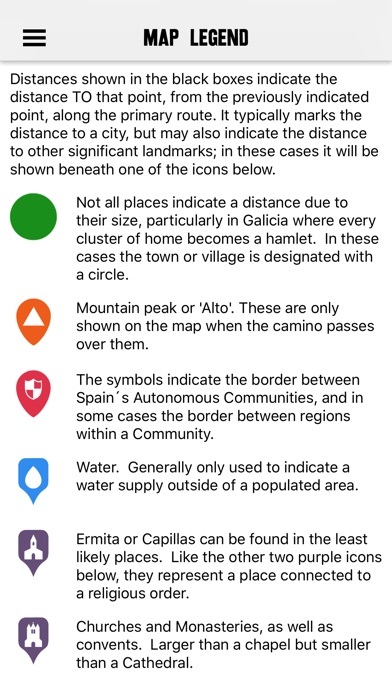 I am returning to the Camino for second time and I found this guide to be very helpful and well designed on my first trip. My favorite features are the maps, elevation charts, and albergue listings - easy to use and have just the right amount of detail. Well done Wise Pilgrim.